When you get back on the ground, it's often tempting to rush off to the next thing. Everyone has busy lives, and pilots are no exception  family, friends, and work often compete for our time in the air, and it's not unusual to find yourself thinking about the next place you have to be the moment you idle the fuel mixture. Close your flight plan, if you filed one. Be certain that the plane is tied down and the doors locked. If not, has someone else confirmed to you that they will use it before the end of day? Complete your renter's ticket with the approprate Hobbs and tach time, and be sure to note if you've added any fuel or oil. 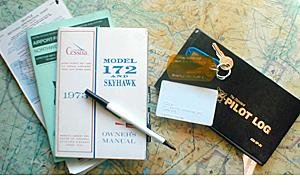 Return the key and gas card to the aircraft logbook. Take a moment to fill out your own Pilot's Logbook right after your flight to ensure your personal records are complete and accurate. It's bad form to hit the door before you pay up  please find a Willamette Aviation representative to assess your charges. And finally, did you forget anything? We don't mind collecting stray headsets, handheld radios, and flight computers, but you may be scratching your head the next time you dig through your flight bag when you can't find an important piece of equipment. It only takes a few moments to check in before you return to life back on Earth  making sure that everything's in order is a good habit, while also extending consideration to your fellow pilots.